In a nutshell, the Federal Bureau of Investigation and the Justice Department permitted Hillary Clinton’s aide Cheryl Mills — the subject of a criminal investigation, who had been given immunity from prosecution despite strong evidence that she had lied to investigators — to participate as a lawyer for Clinton, the principal subject of the same criminal investigation. This unheard-of accommodation was made in violation not only of rudimentary investigative protocols and attorney-ethics rules, but also of the federal criminal law. Yet, the FBI and the Justice Department, the nation’s chief enforcers of the federal criminal law, tell us they were powerless to object. Seriously? 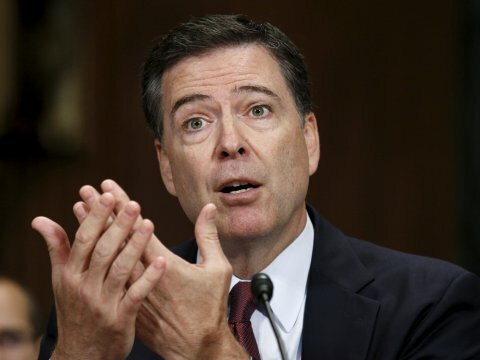 In his testimony this week before the House Judiciary Committee, FBI director James Comey inveighed against critics who have slimed the Bureau as “weasels” over its handling of the Clinton e-mails investigation. I am not one of those people. After a quarter-century in the trenches with the Bureau as a prosecutor, I am one of those hopeless romantics who love the FBI and harbor real affection for the director himself. I genuinely hate this case. I don’t mind disagreeing with the Bureau, a not infrequent occurrence in my former career. But I am hardwired to presume the FBI’s integrity. Thus, no matter how much irregularities in the Clinton investigation have rankled me, I’ve chalked them up to the Bureau’s being hamstrung. There was no chance on God’s green earth that President Obama and his Justice Department were ever going to permit an indictment of Hillary Clinton. Jim Comey says he didn’t make his final decision to recommend against prosecution until after Mrs. Clinton was interviewed at the end of the investigation, and that he did not coordinate that decision with his Obama-administration superiors. If he says so, that’s good enough for me. But it doesn’t mean the director made his decision detached from the dismal reality of the situation. And whatever one’s armchair-quarterback view on how he should have handled it, that reality was not of his making. But just as Director Comey rightly objects to being regarded as a weasel, I don’t much like being regarded as an idiot . . . which is what I’d have to be to swallow some of this stuff. The FBI absolutely has control over who may be present at an interview with a subject of an investigation. There are a variety of reasons for this, but the most basic one is that an interview never has to happen unless the FBI consents to it. In his testimony, Comey kept stressing that Mrs. Clinton’s interview was “voluntary” — contending that since she was not required to submit to it, she could impose any conditions on her agreement to do so. That is nonsense. The interview was voluntary on both sides. The FBI is never required to indulge conditions that make a mockery of its serious business. In this regard, Comey is like a guy who ties his own hands behind his back and then says he was powerless to defend himself. If Clinton declined to submit to an FBI interview unless Mills (or the similarly situated lawyer Heather Samuelson) was permitted to be present, the investigators could simply have handed her a grand-jury subpoena. They could then have politely directed her to a chamber where she would be compelled to answer questions — under oath and all by her lonesome, without any of her lawyer legion in attendance. But, you see, in this investigation — unlike every other major criminal investigation in which the government tries to make the case rather than not make the case — the Justice Department declined to convene a grand jury. Comey is like a guy who ties his own hands behind his back and then says he was powerless to defend himself. Regarding this highly irregular dereliction, there appears to have been no FBI pushback. In fact, Director Comey told the committee that it is often easier in a complex case to acquire evidence by striking informal agreements with defense lawyers. That is certainly true . . . but there is nothing inconsistent about impaneling a grand jury while concurrently negotiating such deals. Indeed, this is how it is generally done, precisely because it makes defense lawyers a whole lot more agreeable. It is the same principle that applies to U.S. diplomatic negotiations: They go much smoother when the other country grasps that we have the U.S. armed forces in our back pocket. When they know the alternative is a grilling of their client in the grand-jury hot seat, defense lawyers are less apt to insist on outrageous interview conditions, and the government tends not to have to extend inexplicable immunity grants to obtain evidence that is accessible by simply serving a subpoena. As I’ve previously explained, the FBI has no authority to convene a grand jury. That is up to the Justice Department. In this case, there was no way the Obama Justice Department was going to indict Mrs. Clinton, so it clearly resisted convening a grand jury. Doing so would have underscored the gravity of offenses that the Justice Department was working energetically, and in conjunction with Team Clinton’s lawyers, to downplay. That is how Ms. Mills ended up in the room for Mrs. Clinton’s interview as a lawyer, after having been in the interview room herself as a subject of the same investigation. Another funny thing about that. I mentioned that Clinton had a battalion of lawyers. They included her primary lawyers from Williams & Connolly, among the finest criminal-defense attorneys in the country. Since she had plenty of top-notch representation, she certainly did not need Cheryl Mills as a lawyer. Besides, Ms. Mills does not appear to have been practicing much law at the time. She had not functioned as a lawyer in her years as Clinton’s top staffer at the State Department. It appears that, on leaving State with Clinton, she spent her time, apart from sitting on the board of the Clinton Foundation (the Hillary campaign in waiting), running the BlackIvy Group, a development company that builds business enterprises in Africa. I don’t mean to imply that Ms. Mills is anything but an able lawyer. I’m just suggesting that she doesn’t seem to have been someone you’d have called in 2014 if, like Hillary Clinton, you’d gotten jammed up in a criminal investigation. That’s what you call Williams & Connolly for. But you might call Cheryl Mills, who was right by your side at the State Department while you were doing those things that got you jammed up, if your goal was to envelop those things in an obstructive fog of purported attorney-client privilege. The FBI was not required to treat a conspiracy to obstruct justice as if it were good-faith assistance of counsel. Nevertheless, co-conspirator Mills was laundered into lawyer Mills. When Mills lied to agents about not knowing of the Clinton homebrew server while at State — a story that doesn’t pass the laugh test — this false account was shrugged off as one of those innocent, unresolvable failures of recollection. The classified information on Mills’s private laptop was excused, according to Comey’s testimony, because it merely duplicated (for purposes of sorting through e-mails) what was on Clinton’s server — a rationalization that, even if true, is not a defense to recklessly storing classified information on a non-secure computer. When Cheryl Mills tried to walk into Hillary Clinton’s interview, the FBI should have enforced the law. Then, when case agents sensibly wanted to scrutinize the laptop, the Justice Department gave Mills immunity in exchange for this item whose production could have been compelled by a subpoena. On this, Director Comey’s account, again, is puzzling. He rationalizes the immunity grant as an appropriate way to deal with the complications of searching a lawyer’s computer, which is bound to contain privileged communications with many clients. But quite apart from the fact that Mills these days seems to have only a single “client,” the director is mixing apples and oranges. Immunity is conferred to shield a suspect from criminal liability, not to shield a lawyer’s clients from government intrusion into their privileged legal communications. There are other protective procedures for the latter situation. The FBI relies on this airbrushing of Mills to suggest that she wasn’t really much of a suspect; therefore, we’re to believe, the fact that she sat in on Clinton’s interview, though perhaps a bit irregular, is no big deal. But it is a very big deal for at least three reasons. First, Comey says he didn’t decide not to seek an indictment of Clinton until after Clinton’s interview. If that is so, then the FBI had to know that allowing Mills to be present at the interview could have jeopardized any eventual prosecution of Clinton. In such a prosecution, Mills would have been a key witness. But Clinton’s lawyers would have claimed that the FBI let Mills sit in on Clinton’s interview to help Mills get her story straight. They would have accused prosecutors of exploiting Mills, a former member of the Clinton legal team, to pry into Clinton’s privileged strategic communications with her other lawyers. Finally, as Shannen Coffin has pointed out, Mills was not just violating an ethical rule. Her representation of Clinton runs afoul of federal law. Section 207 of the penal code makes it a crime for a former government official to attempt to influence the government on behalf of another person in a matter in which the former official was heavily involved while working for the government. It was against the law for Mills, as an attorney, to attempt to influence the Justice Department’s consideration of the case against Clinton. I couldn’t agree more with Director Comey that the FBI is the world’s greatest law-enforcement agency. I just think that when Cheryl Mills tried to walk into Hillary Clinton’s interview, the FBI should have enforced the law.